Sometimes a leather personnel carrier (i.e. your boots) just isn't enough. For those occasions, this book is what you need. Publisher's blurb: "Sometimes battle dress is just not enough. Upgrading the vehicle creation system from Civilian Vehicles, Military Vehicles gives you the armour and weaponry you need for mass destruction. 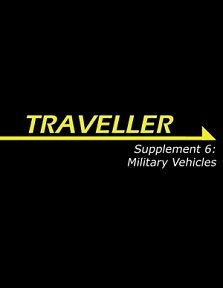 From simple scout skimmers to heavy self-propelled guns, to giant walking mecha, Military Vehicles contains everything a Traveller needs for self-defence on the road, in the wilderness and in the skies."